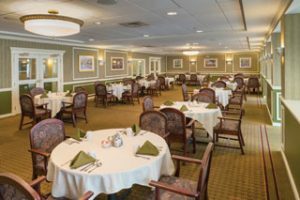 Gracious dining is central to the lifestyle experience at Prospect House. Here, fine food and healthy living go hand-in-hand. Each day we serve up generous portions of both in the most cheerful of dining rooms among the best of friends. Three delicious and nutritious meals are prepared daily by our talented chefs and served by a courteous and caring wait staff. Our menus change with the seasons, with selections as fresh as the daily conversation and as delightful as the wonderful residents who inspire our cuisine and the locally-sourced ingredients that distinguish it. Since happiness loves company, family and friends are always welcome, especially for theme dinners and outdoor barbecues. It’s also our pleasure to make special arrangements for birthdays, anniversaries or other family gatherings.